New World vulture is the common designation for any of the large and very large birds comprising the family Cathartidae, characterized by a head with few or no feathers, a perforate nasal septum, keen sight, good soaring ability, highly social behavior, and generally by scavenging behavior, feeding primarily on carrion. Of the seven extant species found in the Americas, five include the name vulture as part of their common name, while the other two commonly are known as condors. New World vultures belong to a different family than the superficially similar Old World vultures (family Accipitridae), which share a similar featherless head, large size, good sight, scavenging behavior, and good soaring ability. However, they are not considered to be closely related genetically and generally are even placed in different orders, with New World vultures placed in Ciconiiformes with storks and Old World vultures in Falconiformes with eagles, buzzards, and hawks. Old World vultures lack the good sense of smell of some of the New World vultures and are limited to finding carcasses by sight. Although today the Western image of vultures often carries negative connotations, with the term vulture used as a metaphor for those who prey on the weak or dying, they actually play a valued role in terrestrial ecosystems as scavengers. Historically, they also had more favorable images, being important in the mythology and rituals of pre-Columbian cultures. Indeed, the king vulture sometimes was portrayed as a god with a human body and a bird head, who often carried messages between humans and other gods (Tozzer and Allen 1910). The fact that vultures play important ecological and symbolic roles reflects the principle of bi-level functionality, whereby entities in nature not only advance their own individual purpose of survival and reproduction but also values for larger entities (for the ecosystem, humans). Although human-generated toxins and other pollutants have placed stress on vulture populations, humans also have acted as stewards of creation in trying to protect vulture populations. In 1987, all surviving birds of the critically endangered California condor were removed from the wild and placed in a captive breeding program that successfully resulted in an increase in their numbers (BI 2006). By 2005, there were 127 Californian condors back in the wild. Cathartidae, the New World vultures, contains seven extant species found in warm and temperate areas of the Americas. Excluding Cathartes, all genera are considered to be monotypic. New World vultures are large to very large birds. The smallest species is the lesser yellow-headed vulture, Cathartes burrovianus, which weighs about 0.94 kilograms (2.1 pounds) (Wallace 2004) and has a length of about 56 to 61 centimeters (22 to 24 inches). Two other members of the Cathartes genus also are among the smaller members of this family, with the greater yellow-headed vulture (C. melambrotus) weighing about 1.2 kilograms (2.6 pounds), and the turkey vulture (C. aura) weighting about 1.5 kilograms (3.3 pounds) (Wallace 2004). The largest members of this family are the California and Andean condors, both of which can reach 120 centimeters (48 inches) in length and weigh 12 or more kilograms (26 or more pounds). Wallace (2004) reports that the Andean condor is one of the largest flying birds in the world, with females weighing from 8.3. to 10.5 kilograms (18 to 23 pounds) and males from 10.9 to 15 kilograms (24 to 33 pounds). While this bird is sexually dimorphic in size, as well as color and shape, the smaller vultures are sexually monomorphic in size and color (Wallace 2004). The California condor (Gymnogyps californianus) also is sexually monomorphic in size and color, although it is quite large, with males and females reaching about 7.7 to 10.9 kilograms and with a wingspan of 2.9 meters (114 inches) (Wallace 2004). All species have long, broad wings and a stiff tail, suitable for soaring (Reed 1914). They are the best adapted to soaring of all land birds (Ryser and Ryser 1985, 211). The feet are clawed but weak and not adapted to grasping (Krabbe 1990, 88). The front toes are long with small webs at their bases (Feduccia 1999). No New World vulture possesses a developed syrinx (Kemp and Newton 2003, 146), the vocal organ of birds, therefore the voice is limited to infrequent grunts, growls, and hisses (Howell and Webb 1995; Wallace 2004). Plumage is predominantly black or brown, and is sometimes marked with white. All species have featherless heads and necks (Zim et al. 2001). In some, this skin is brightly colored, and in the king vulture it is developed into colorful wattles and outgrowths. In the sexually dimorphic Andean condor, the iris color of the female is a deep red, while it is tan in the male (Wallace 2004). The beak of New World vultures is slightly hooked and is relatively weak when compared those of other birds of prey (Krabbe and Fjeldså 1990, 88). Its being weak relates to its being adapted to tear the weak flesh of partially rotted carrion, rather than fresh meat (Ryser and Ryser 1985, 211). The nostrils are oval and are set in a soft cere (Terres 1991, 957). The nasal passage is not divided by a septum (they are "perforate"), so from the side one can see through the beak (Allaby 1992), as in the turkey vulture. The eyes are prominent and, unlike those of eagles, hawks, and falcons, they are not shaded by a bony brow bone (Terres 1991). Members of Coragyps and Cathartes have a single incomplete row of eyelashes on the upper lid and two rows on the lower lid, while Gymnogyps, Vultur, and Sarcoramphus lack eyelashes altogether (Fisher 1942). New World vultures have the unusual habit of urohydrosis, or emitting liquid waste on the bare portion of their legs where blood vessels are densely packed close to the skin and can be cooled by evaporation, reducing their core body temperature (Wallace 2004; Sibley and Ahlquist 1991). As this behavior is also present in storks, it is one of the arguments for a close relationship between the two groups (Sibley and Ahlquist 1991). New World vultures are found from southern Canada in North America to the southern tip of South America, at Tierra del Fuego. The most widely distributed is the turkey vulture (Cathartes aura), which ranges from the Canadian border to the southern tip of South America, with one of its subspecies, C. aura aura, being highly migratory, spending winters in the southern United States to northern South America area and its summer breeding range extending north through New England (Wallace 2004). Cathartid vultures can be found in every habitat where they can effectively exploit carrion, including deserts, open grasslands and savannas, forests, coastlines, mountains, and even cities, among other habitats (Wallace 2004). Three species are even adapted to exploit forest, utilizing their sense of smell to find even small carcasses of reptiles, birds, and mammals (Wallace 2004). The featherless head of the American black vulture, Coragyps atratus brasiliensis, reduces bacterial growth from eating carrion. All living species of New World vultures and condors are scavengers. Though their diet is overwhelmingly composed of carrion, some species such as the American black vulture have been recorded as killing live prey. Other additions to the diet include fruit, eggs, and garbage. Species in genus Cathartes have a highly developed sense of smell, which they use to find carrion. They locate carrion by detecting the scent of ethyl mercaptan, a gas produced by the beginnings of decay in dead animals. The olfactory lobe of the brains in these species, which is responsible for processing smells, is particularly large compared to that of other animals (Snyder 2006, 40). Other New World vulture species, such as the American black vulture and the king vulture, have much weak senses of smell and find food by sight, sometimes by following Cathartes vultures and other scavengers (Kemp and Newton 2003, 147). The head and neck of New World vultures appear to be featherless as an adaptation for hygiene; this lack of feathers prevents bacteria from the carrion it eats from ruining its feathers and it exposes the skin to the sterilizing effects of the sun. New World vultures roost together nightly and forage communally, exhibiting a highly gregarious nature (Wallace 2004). New World vultures and condors do not build nests. Instead, they lay eggs on bare surfaces. One to three eggs are laid, depending on the species (Zim et al. 2001). The three Cathartes species and the black vulture all lay annually three eggs, while the king vulture and the two condors lay only one egg per year (Wallace 2004). Chicks are naked at hatching and later grow down. The parents feed the young by regurgitation (Terres 1991). The young are altricial and fledge in 2 to 3 months (Howell and Webb 1995). The New World vultures comprise seven species in five genera. The genera are Coragyps, Cathartes, Gymnogyps, Sarcoramphus, and Vultur. Of these, only Cathartes is not monotypic. New World vultures were traditionally placed in a family of their own in the Falconiformes (Sibley and Ahlquist 1991), the same order in which the Old World vultures are placed. However, in the late twentieth century, some ornithologists argued that they are more closely related to storks on the basis of karyotype (de Boer 1975) and morphological (Ligon 1967) and behavioral (Konig 1982). For example, the New World vultures never rest on one foot, as seen in birds of prey, but rather lie down, and the cathartids, like storks, use urohydrosis (noted above) for evaporative cooling (Wallace 2004). On the basis of such date, some authorities now place the New World vultures in the Ciconiiformes with the storks and herons; Sibley and Monroe (1990) even considered them a subfamily of the stork family. This placement of New World vultures in Ciconiiformes has been criticized as an oversimplification by some (Griffiths 1994; Fain and Houde 2004), and recently genetic evidence has been presented against it (Cracraft et al. 2004; Gibb et al. 2007). Consequently, there is a recent trend to raise the New World vultures to the rank of an independent order Cathartiformes not closely associated with either birds of prey or storks or herons (Ericson et al. 2006). In 2007, the American Ornithologists' Union's North American checklist moved Cathartidae back into the lead position in Falconiformes (AOU 2007). The AOU's draft South American checklist calls the Cathartidae incertae sedis (of uncertain position) rather than placing it any order (Remsen et al. 2007). Cathartids were widespread in both the Old World and North America during the Neogene. The earliest New World vulture in the fossil record traces to late Paleocene deposits in England. Fossil records first show the New World vultures appearing in the Americas in the early Oligocene, alongside Old World type vultures that became extinct in the New World toward the end of the Pleistocene about 10,000 to 20,000 years ago (Wallace 2004). The name Cathartidae comes from cathartes, Greek for "purifier." A related extinct family were the Teratornithidae or Teratorns, essentially an exclusively (North) American counterpart to the New World vultures—the latter were, in prehistoric times, also present in Europe and possibly even evolved there. The Incredible Teratorn is sometimes called "Giant Condor" because it must have looked similar to the modern bird. They were, however, not very closely related but rather an example of parallel evolution, and the external similarity is less emphasized in recent times due to new information suggesting that the teratorns were more predatory than vultures (Campbell and Tonni 1983). The fossil history of the Cathartidae is fairly extensive, but nonetheless confusing. Many taxa that may or may not have been New World vultures were considered to be early representatives of the family. There is no unequivocal European record from the Neogene and trying to retrace the evolutionary history of the entire Ciconiiformes sensu Sibley & Ahlquist by means of molecular analysis has proven to be just as equivocal until the mid-2000s. Fossils found in Mongolia (Late Oligocene), Lee Creek Mine, United States (Late Miocene/Early Pliocene), Argentina (Middle Pliocene) and in more recent deposits on Cuba have not been assigned to a genus yet. There is also a number of extinct congeners of the extant species. A European genus from the earliest Neogene that possibly belongs to the New World vultures is Plesiocathartes. On the other hand, the bathornithid Neocathartes was long believed to be a peculiar New World vulture. New World vultures were important in the mythology and rituals of pre-Columbian cultures (Wallace 2004). The American black vulture and the king vulture appear in a variety of Maya hieroglyphics in Mayan codices. The King vulture is one of the most common species of birds represented in the Mayan codices (Tozzer and Allen 1910). Its glyph is easily distinguishable by the knob on the bird’s beak and by the concentric circles that represent the bird’s eyes (Tozzer and Allen 1910). It is sometimes portrayed as a god with a human body and a bird head (Tozzer and Allen 1910). According to Mayan mythology, this god often carried messages between humans and the other gods. It is also used to represent Cozcaquauhtli, the thirteenth day of the month in the Mayan calendar (Tozzer and Allen 1910). In Mayan codices, the American black vulture is normally connected with death or shown as a bird of prey, and its glyph is often depicted attacking humans. This species lacks the religious connections that the king vulture has. While some of the glyphs clearly show the American black vulture’s open nostril and hooked beak, some images are assumed to be this species because they are vulture-like and painted black, but lack the king vulture’s knob (Tozzer and Allen 1910). While the vulture often were important symbols in burial rituals, often associated by early human cultures with death, they are not as respected today (Wallace 2004). Although they play a valuable ecological role as scavengers, removing dead animals, the term vulture in Western world often has an unfavorable connotation. Many vultures today also have suffered from pollution, including the accumulation of human-generated toxins and contaminants (Wallace 2004). The California condor is critically endangered (BI 2006). This bird once had a large range, with its Pleistocene population spanning southern North America (Wallace 2004). By modern times, it was restricted to just the West coast. In 1987, all surviving birds were removed from the wild into a captive breeding program to ensure the species' survival (BI 2006). In 2005, there were 127 Californian Condors in the wild. The Andean condor is near threatened (BI 2004). 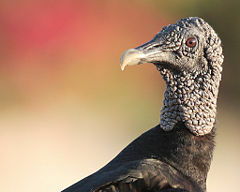 The American black vulture, turkey vulture, lesser yellow-headed vulture, and greater yellow-headed vulture are listed as species of Least Concern by the IUCN Red List. This means that populations appear to remain stable, and they have not reached the threshold of inclusion as a threatened species, which requires a decline of more than 30 percent in ten years or three generations (BI 2001). American Ornithologists Union (AOU). 2007. Check-list of North American Birds. American Ornithologists' Union. Retrieved May 28, 2008. Allaby, M. 1992. The Concise Oxford Dictionary of Zoology. Oxford: Oxford University Press. ISBN 0192860933. Avise, J. C., W. S. Nelson, and C. G. Sibley. 1994. DNA sequence support for a close phylogenetic relationship between some storks and New World vultures. Proc. Natl. Acad. Sci. USA 91(11): 5173-5177. Retrieved May 28, 2008. Erratum. 1995. PNAS 92(7); 3076. Retrieved May 28, 2008. BirdLife International(BI). 2004. 2001 categories & criteria (version 3.1). International Union for Conservation of Nature and Natural Resources. Retrieved May 28, 2008. BirdLife International(BI). 2006. Vultur gryphus. 2006 IUCN Red List of Threatened Species. IUCN 2006. Retrieved May 28, 2008. BirdLife International(BI). 2006. Gymnogyps californianus. 2006 IUCN Red List of Threatened Species. IUCN 2006. Retrieved May 28, 2008. Campbell, K. E., and E. P. Tonni. 1983. Size and locomotion in teratorns. Auk 100(2): 390-403. Retrieved May 28, 2008.
de Boer, L. E. M. 1975. Karyological heterogeneity in the Falconiformes (Aves). Cellular and Molecular Life Sciences 31(10): 1138-1139. Cracraft, J., F. K. Barker, M. Braun, J. Harshman, G. J. Dyke, J. Feinstein, S. Stanley, A. Cibois, P. Schikler, P. Beresford, J. García-Moreno, M. D. Sorenson, T. Yuri, and D. P. Mindell. 2004. Phylogenetic relationships among modern birds (Neornithes): Toward an avian tree of life. Pages 468-489 in J. Cracraft and M. J. Donoghue, edsl, Assembling the tree of life. Oxford University Press, New York. Retrieved May 28, 2008. Ericson, P. G. P., C. L. Anderson, T. Britton, A. Elżanowski, U. S. Johansson, M. Kallersjö, J. I. Ohlson, T. J. Parsons, D. Zuccon, and G. Mayr. 2006. Diversification of Neoaves: Integration of molecular sequence data and fossils. Biology Letters, in press. Feduccia, J. A. 1999. The Origin and Evolution of Birds. Yale University Press. ISBN 0226056414. Fisher, H. I. 1942. The Pterylosis of the Andean condor. Condor 44(1): 30-32. Retrieved May 28, 2008. Gibb, G. C., O. Kardailsky, R. T. Kimball, E. L. Braun, and D. Penny. 2007. Mitochondrial genomes and avian phylogeny: complex characters and resolvability without explosive radiations. Molecular Biology Evolution 24: 269–­280. Retrieved May 28, 2008. Howell, S. N. G., and S. Webb. 1995. A Guide to the Birds of Mexico and Northern Central America. New York: Oxford University Press. ISBN 0198540124. Kemp, A. and I. Newton. 2003. New World vultures. In C. Perrins, ed., The Firefly Encyclopedia of Birds. Firefly Books. ISBN 1552977773. Krabbe, N., and J. Fjeldså. 1990. Birds of the High Andes. Apollo Press. ISBN 8788757161. Ligon, J. D. 1967. Relationships of the cathartid vultures. Occasional Papers of the Museum of Zoology, University of Michigan 651: 1-26. Reed, C. A. 1914: The Bird Book: Illustrating in Natural Colors More Than Seven Hundred North American Birds. The University of Wisconsin. Remsen, J. V., C. D. Cadena, A. Jaramillo, M. Nores, J. F. Pacheco, M. B. Robbins, T. S. Schulenberg, F. G. Stiles, D. F. Stotz, and K. J. Zimmer. 2007. A classification of the bird species of South America. Version April 5, 2007. American Ornithologists' Union. Retrieved May 29, 2008. Ryser, F. A., and F. A. Ryser. 1985. Birds of the Great Basin: A Natural History. University of Nevada Press. ISBN 087417080X. Sibley, C. G., and B. L. Monroe. 1990. Distribution and Taxonomy of the Birds of the World. Yale University Press. ISBN 0300049692. Sibley, C. G., and J. E. Ahlquist. 1991. Phylogeny and Classification of Birds: A Study in Molecular Evolution. Yale University Press. ISBN 0300040857. Snyder, N. F. R., and H. Snyder. 2006. Raptors of North America: Natural History and Conservation. Voyageur Press. ISBN 0760325820. Terres, J. K., and National Audubon Society. 1991. The Audubon Society Encyclopedia of North American Birds. Audubon Society. Reprint of 1980 edition. ISBN 0517032880. Tozzer, A. Marston, and G. M. Allen. 1910.. Animal Figures in the Maya Codices. Harvard University. Retrieved May 29, 2008. Wallace, M. P. 2004. Cathartidae. In B. Grzimek, S. F. Craig, D. A. Thoney, N. Schlager, and M. Hutchins. Grzimek's Animal Life Encyclopedia, 2nd edition. Detroit, MI: Thomson/Gale. ISBN 0787657786. Wink, M. 1995, Phylogeny of Old and New World vultures (Aves: Accipitridae and Cathartidae) inferred from nucleotide sequences of the mitochondrial cytochrome b gene. Zeitschrift für Naturforschung 50(11-12): 868-882. Zim, H. S., C. S. Robbins, and B. Bruun. 2001. Birds of North America: A Guide to Field Identification. Golden Publishing. ISBN 1582380902. History of "New World vulture"
This page was last modified on 2 June 2008, at 18:55.